This is my very first planner ever. I've always looked at them in the past and thought, yeah I would never use one of those. 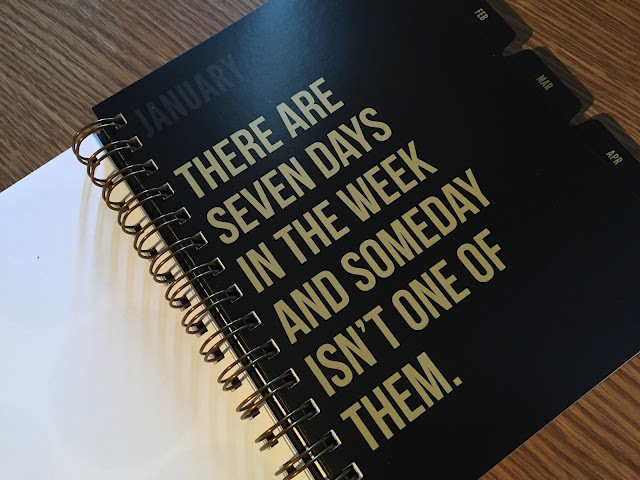 So why this planner? 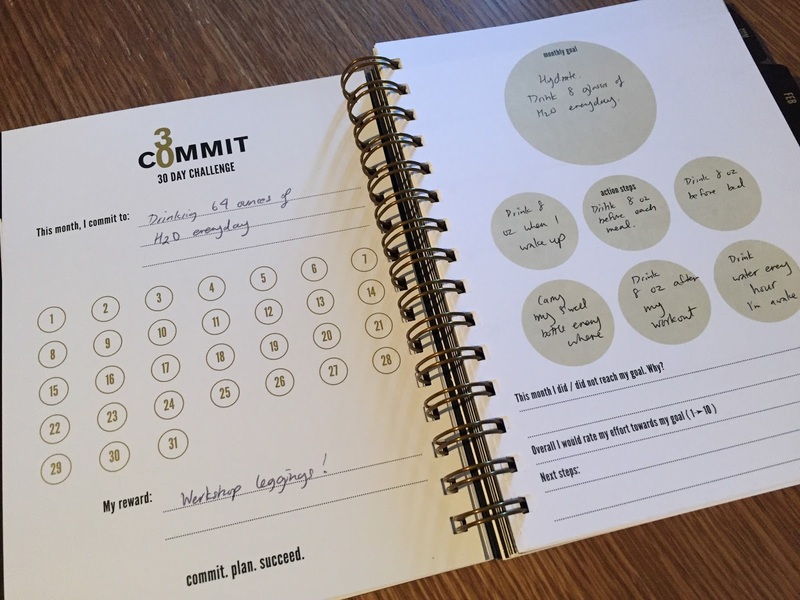 I first heard of this planner from Agent Athletica. You can read her post here. 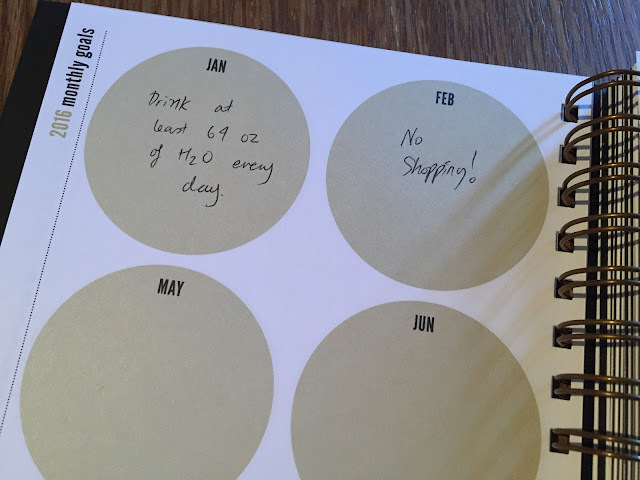 I love a good challenge, and this planner is all about challenges. You can say I've got a competitive streak. And the best part? You can reward yourself at the end of the 30 day challenge. It's like a free pass to buy something! This appeals to the shopaholic inside me. A reward? Yes please! Sign me right up! 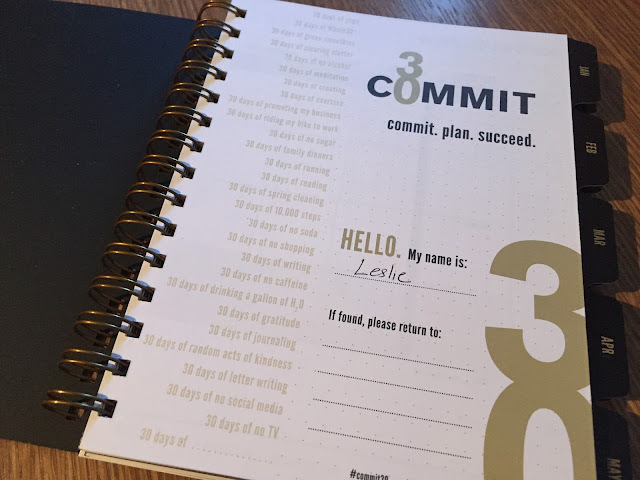 This planner is called Commit 30. Commit to something for 30 days. It could be anything. For January I'm challenging myself to drink at least 64 oz of H2O. Green tea with no sugar added counts, but soda or anything that has sugar does not. I have the hardest time drinking water. I don't know why. I think I maybe average 40 oz a day? I know I get dehydrated too because I'll get these mild headaches. I've already decided for the month of February which is also my birthday month that I will not shop at all for anything unless I need it. That is going to be super hard for me. The reward at the end of February if I make it will be worth it, hopefully! I haven't decided what it will be yet. I don't think I'll really be using the day to day parts of the planner, as I'm not that OCD. I also haven't decided if I'm going to be carrying this around with me everywhere I go as it is pretty thick. About an inch thick or so, but light weight. It's a beautiful planner. You can buy it here on sale for $35. A little pricey, but I hope this will motivate me to challenge myself to be a better person for 2016. One month at a time! I hope everyone has a safe and happy New Year! Here's to 2016! My package came in early this morning while I was still sleeping. I'm pretty excited by the vest since I've never actually worn one before. I almost never wear long sleeve anything, even in the winter. I prefer to wear a short sleeve t-shirt and then a open sweater cardigan or hoodie over it. 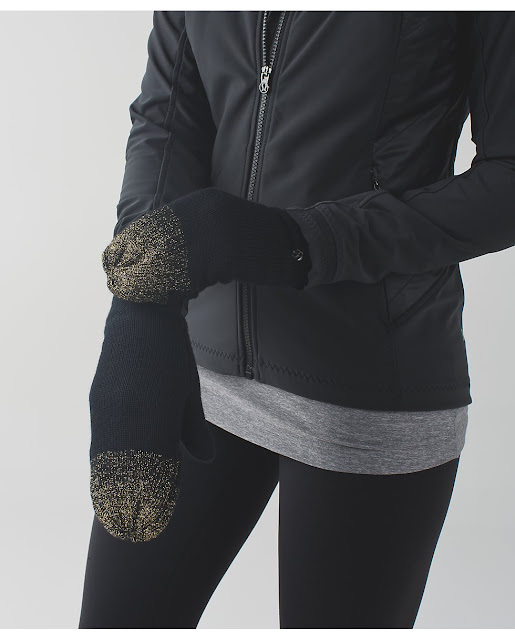 Snow Amazing Mittens Sherpa Black/Gold. I had to get the matching set . Now the mittens are a little big on me. I have tiny hands, but I think I can make them work. These are now sold out on the website though. 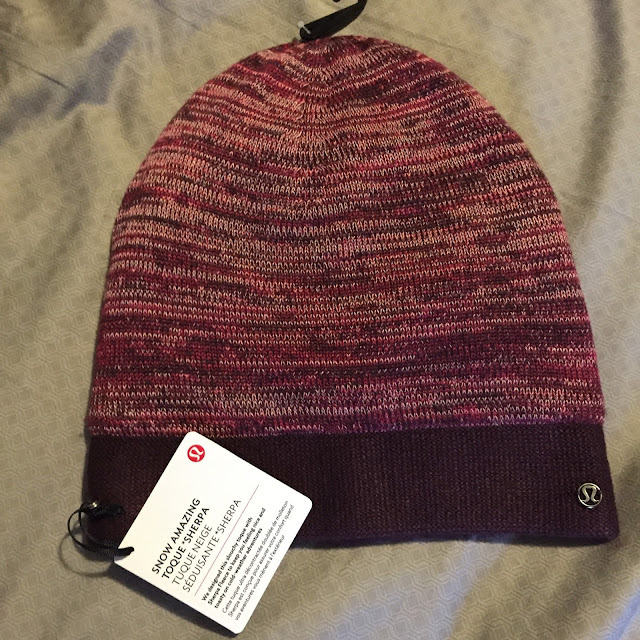 Snow Amazing Toque Sherpa in Berry Rumble. I lose hats ALL the time. So I don't mind stocking up on some every year. The Snow Amazing Toque is lined with Sherpa on the inside, making it super soft and super warm. I can't wait to try these out tonight! I got a size 4 in this. I could have fit the two but it is quite snug, and I prefer a looser fit. If anyone wants a more detailed review on any of these items, let me know in the comments. Now that Christmas is over I guess we're back to one upload per week again. Although the twice a week uploads were pretty uneventful. 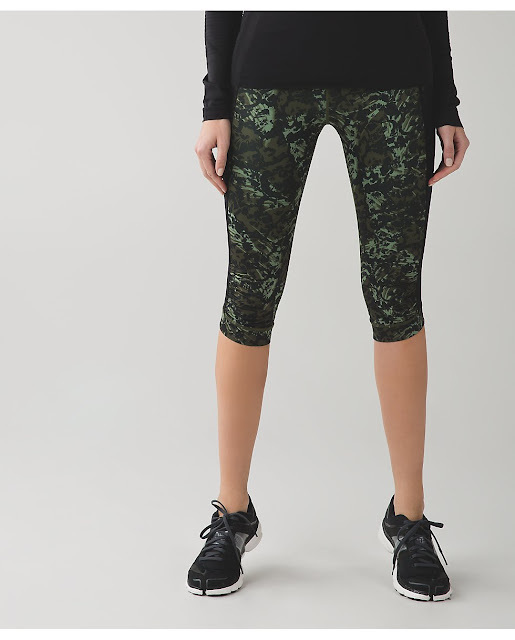 This week it looks like Lululemon is rolling out the swim wear. I asked my husband, "Isn't it a little too soon for swim stuff?" He says, "No because people will be going on vacation and Spring Break is coming up. 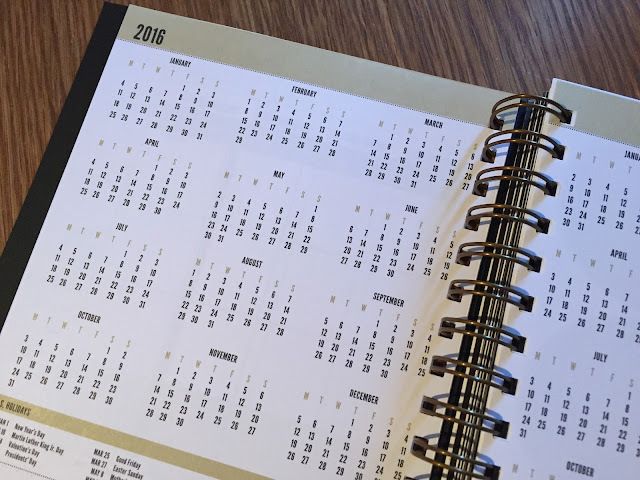 It's usually end of January and beginning of February." That kind of makes sense but I'm still skeptical. We just got out first snow fall last night and after eating so much for the holidays, I don't feel like trying on any swim suits just yet! So I won't be posting any swim wear unfortunately. 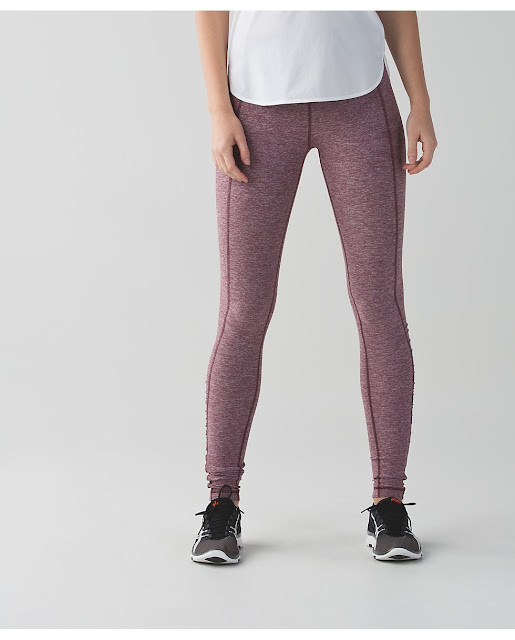 My pick for this week is the High Times Pant. 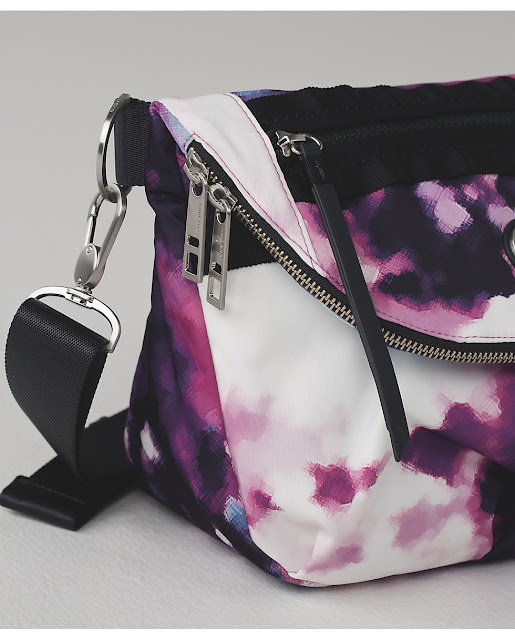 I really like the Blooming Pixie Print and super tempted to get this bag. Or anything in this print! For Canada they got a better upload in my opinion. 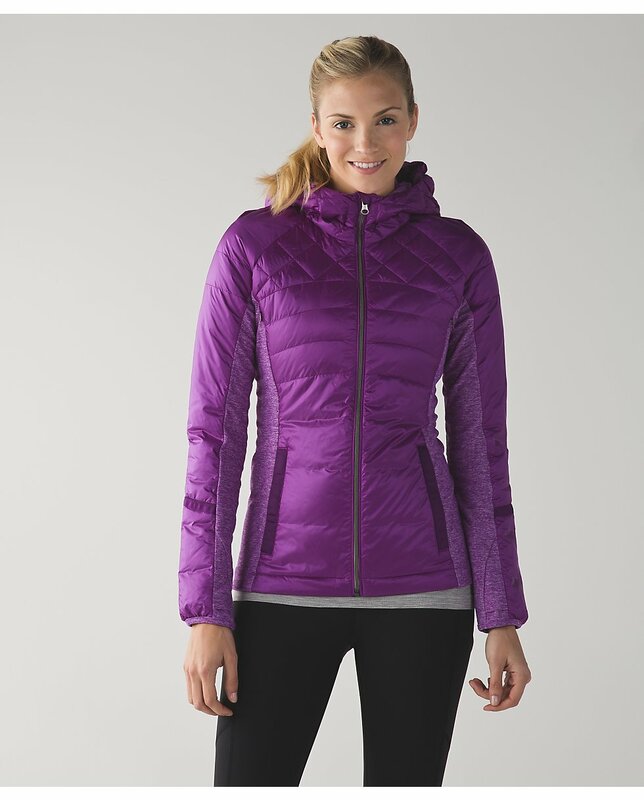 My pick for Canada is definitely the new define jacket. I'm returning the slate gray one I bought in NY in hopes we will get this version. Define Jacket in Diamond Jaquared Berry Rumble. Gorgeous! 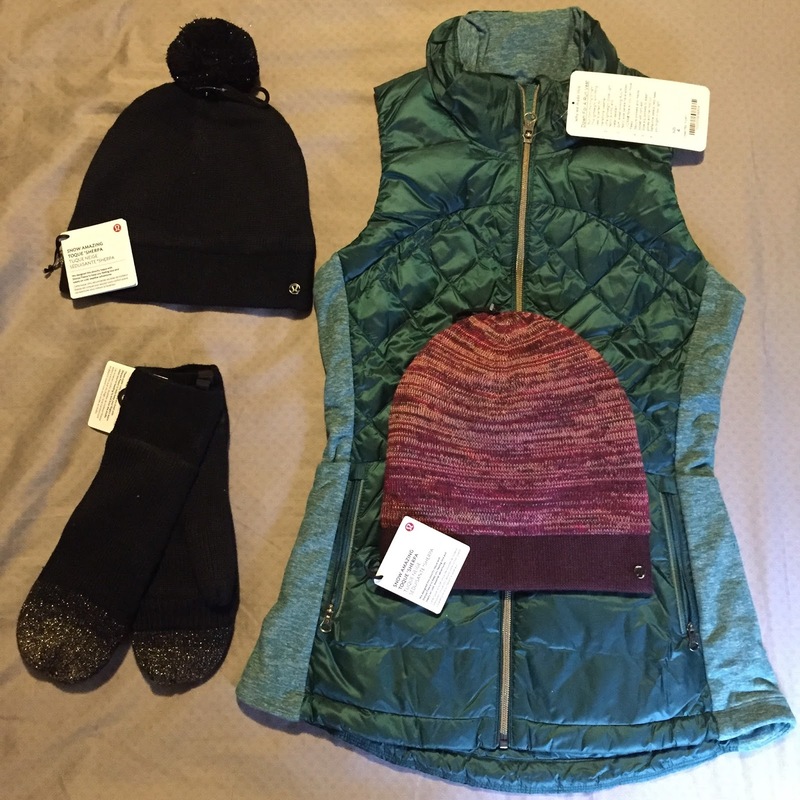 They got a new swiftly in Peacock, and some shorts that I might be interested in, otherwise not much to report. 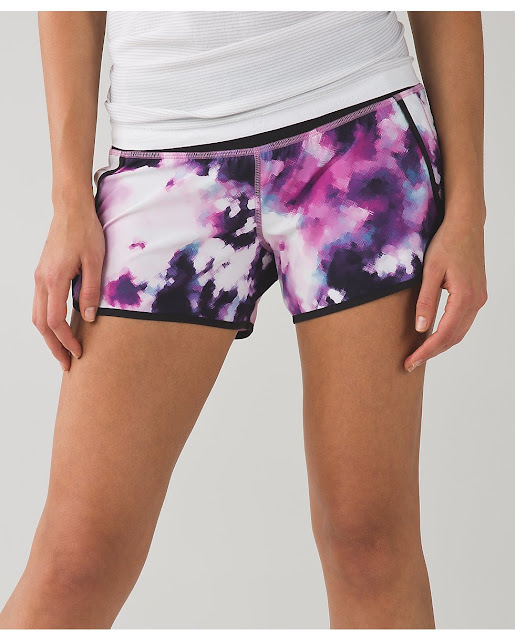 What I really want are the Speed Shorts in Blooming Pixie. Hopefully that will come soon! Swiftly SS in Heathered Raspberry. Very pretty. Run Speed Shorts in Black Blooming Pixie. Review! Werkshop Galaxy Leggings by Ghost & Stars!! 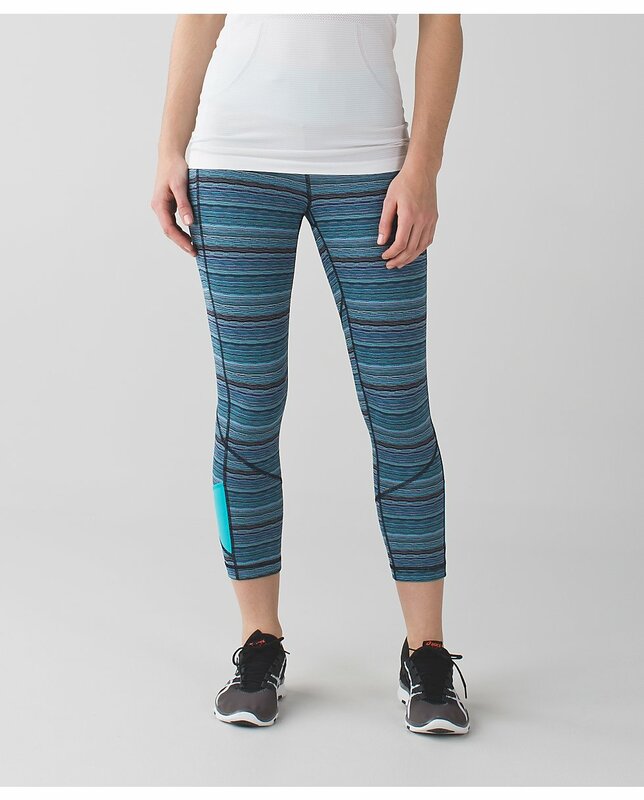 Thanks to AgentAthletica's post I ordered these amazing leggings. Seeing she purchased a size XS, I decided to go up a size. I don't like my pants to fit too tight especially in the waist area so I went with the size small. For reference I'm normally a size 4 in Lululemon WU and High Times Pants. Thankfully these are not loose in the calf area which was what I was worried about. They fit surprisingly well, not too loose not too tight, so I'm a very happy girl. 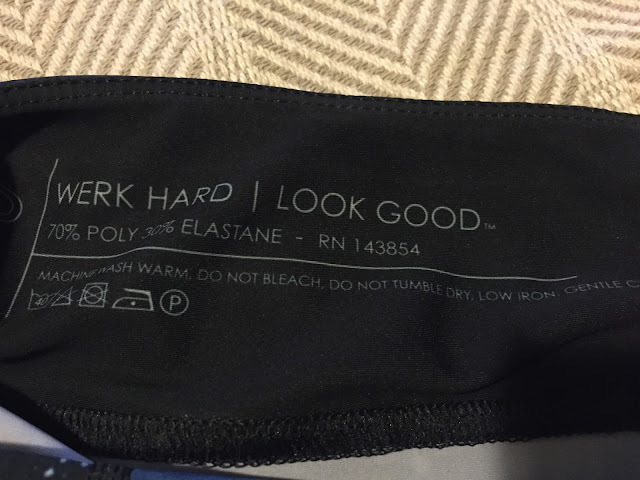 I already wore these out casually with my new Scuba Hoodie. Is it a little too much pattern? Maybe. But totally fun! You can purchase the Galaxy Leggings here. They are $88 but made in the USA! The material is on the thin side, so walking around 40 something degree weather in Boston was a bit chilly but if you walk at a good clip, it isn't bad. Next time I'll wear them with boots. And if these don't rock your boat, they have plenty of other unique leggings for you to try here. I'm totally eyeing the Circus Girl and Unibear leggings. If these are too crazy for you (I love crazy) the Dragon print is pretty cool too. 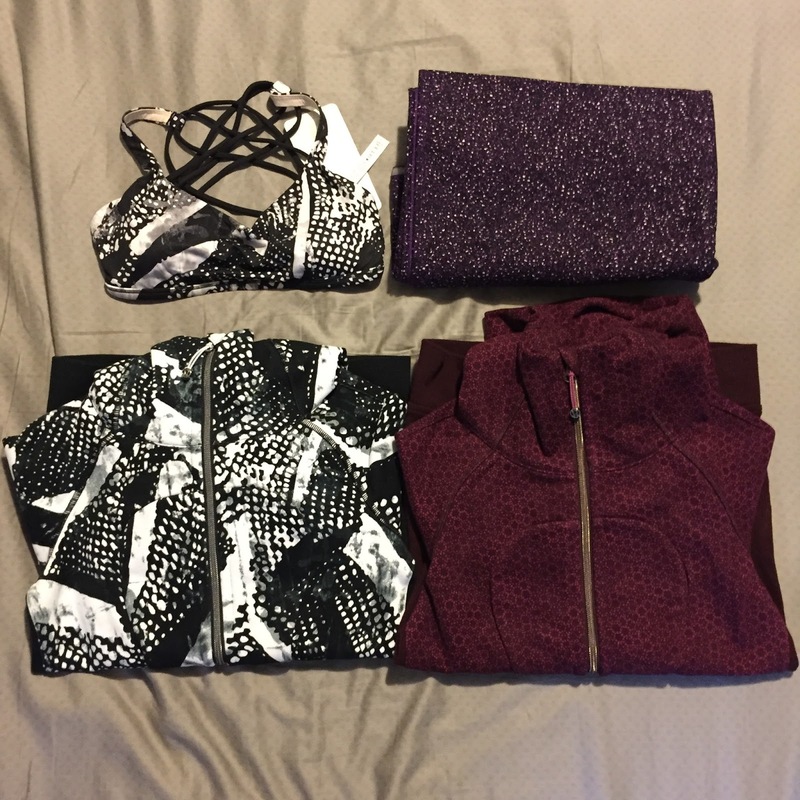 Thanks to 2 day shipping, I received my order on Christmas Eve in a giant Lululemon box. I've never ordered so much before that they had to send it in a box and not one of their shipping envelopes. They also sent me a Lululemon black shopping tote that reminds me a lot like Tumi. Clockwise from the top- Free to Be Wild Bra in Static Mist, Vinyasa Scarf Fleece in Flashback Static Tender Violet, Scuba Hoodie III in Static Mist, Scuba Hoodie III in Star Pixel Raspberry. I'm returning the FTBW bra. 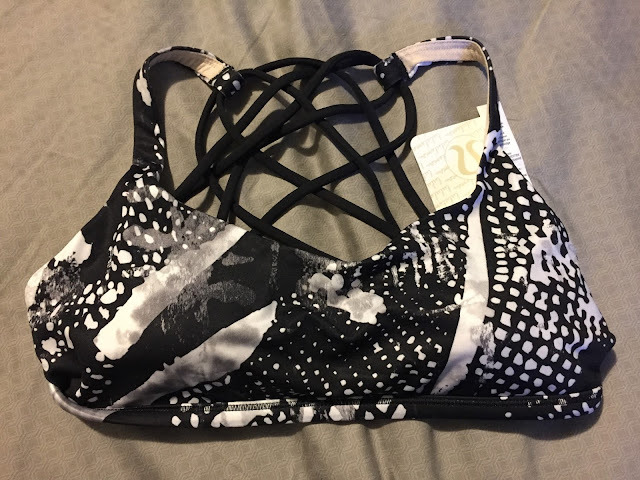 The splotches of gray on the left side just makes the bra look dirty. Not a fan! The Vinyasa Scarf is unfortunately very stiff. 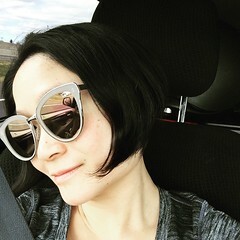 It is very similar to the velour version. Thick and not comfortable around my neck. Also returning. I noticed the website now labels it as Cotton instead of Fleece. It's on sale and still not worth the $39 price. I apologize for the craptastic photos! The apartment is a mess. 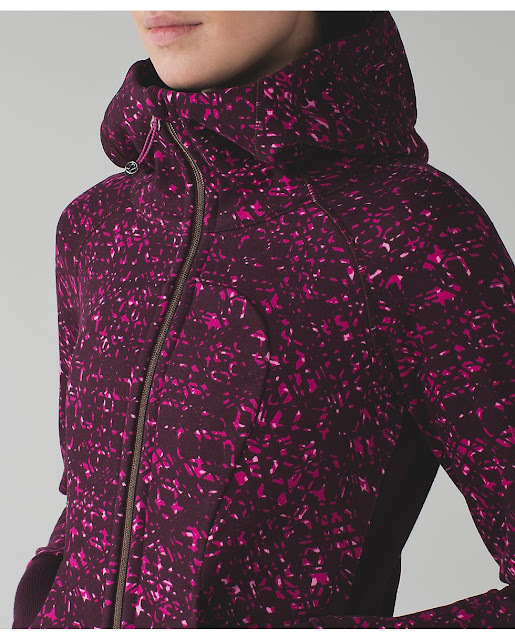 This is the Scuba Hoodie III in Star Pixel Raspberry. 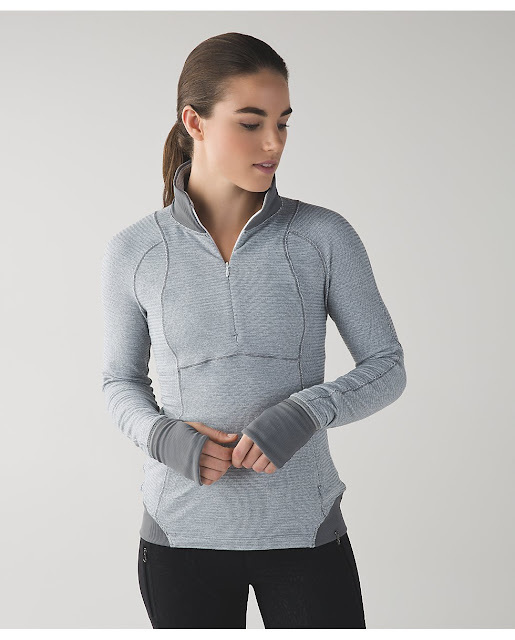 Here's the interesting thing, I always fit the Scuba Hoodies in a size 2, but in this pattern/print the size 2 was very tight across the back of my shoulders and in the armpit area. Easy return. I'm not sure if I like the print enough to go up to a size 4. The print isn't that special in person. Sort of dark and uninteresting. 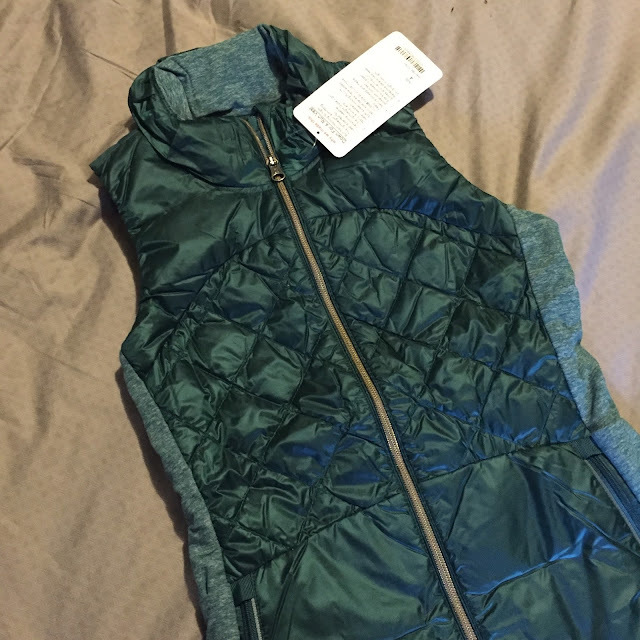 The fabric and feel is also a lot stiffer and not very soft. This is also a size 2, and the hoodie was a much better fit and more like my other Scuba Hoodies. I'm leaning towards keeping this one. I like how unique it is. It also reminds me of Nike! The fabric is not as soft as my Bark Berry Scuba which is my favorite. But it's not a deal breaker. I've been wanting to try Athleta's Icecap Vest for a while now. I got this in the XXS, and it makes my hips look pretty wide. 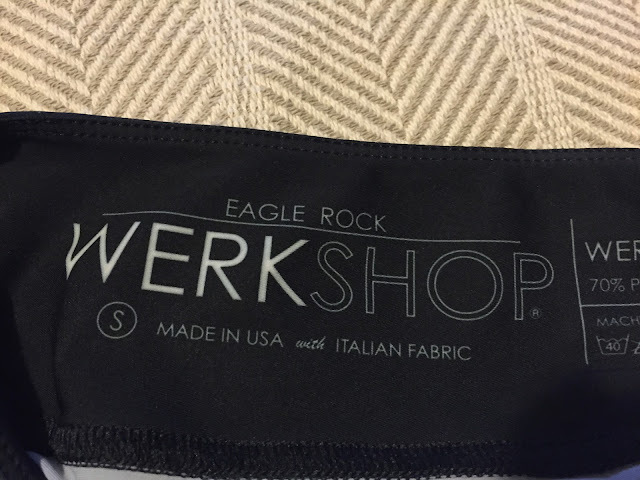 The material is a soft jersey and the color is a grayish purple. Too bad it doesn't look better on me because the price I got it for was insane. $61. But alas I will be returning this too. Here are my picks! At the end of this post I'll tell you what I ordered and what NOT to buy! 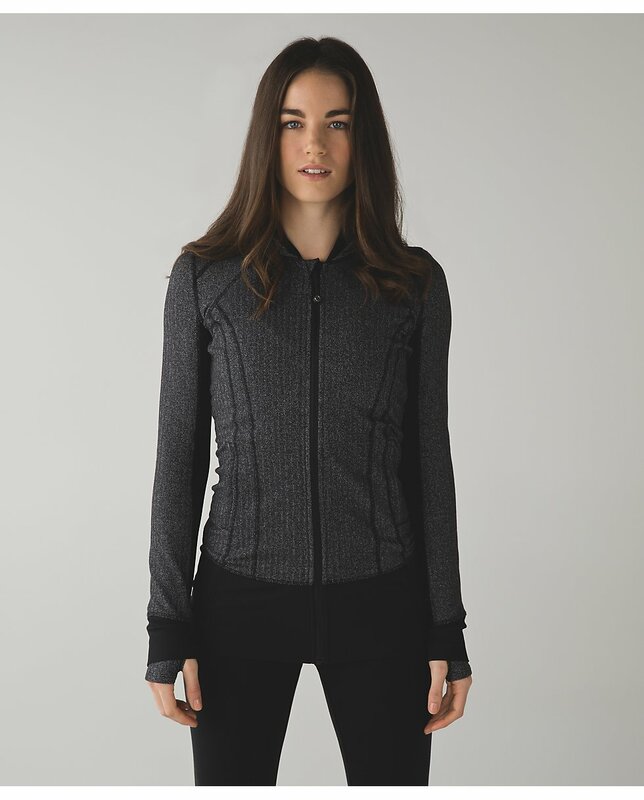 Runderful 1/2 Zip. Comes in 5 different colors to choose from. If it weren't so long on me I would have bought one for $69. Daily Practice Jacket in Heathered Herringbone Black for $89. If I didn't already have this I would get it! 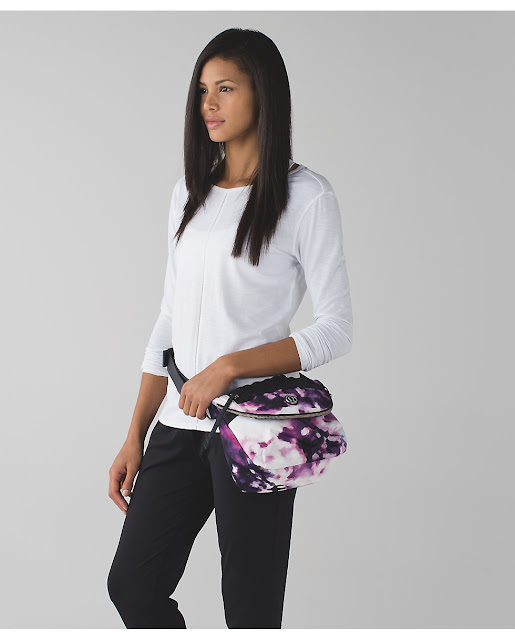 Speed Tight IV in Space Dye Tender Violet $79. I need to try these on before I decide. This one is on my wish list! Turn Around Tight in Heathered Bordeaux Drama. If they still had these in a 4, I would have ordered. 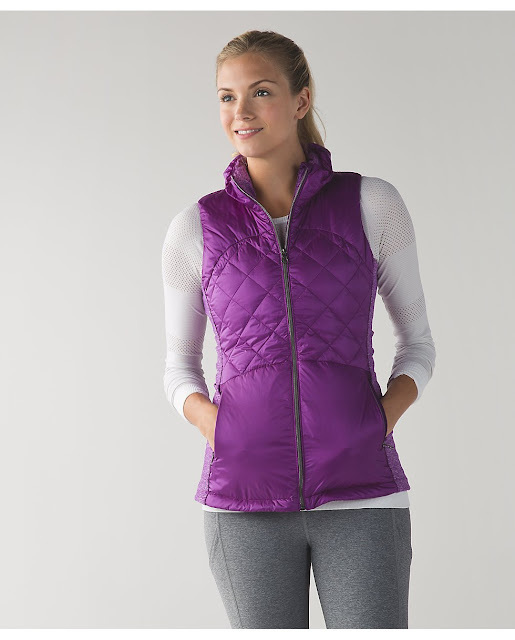 Swiftly Tech Racerback in Heathered Regal Plum $34. I have this exact tank and I LOVE it. 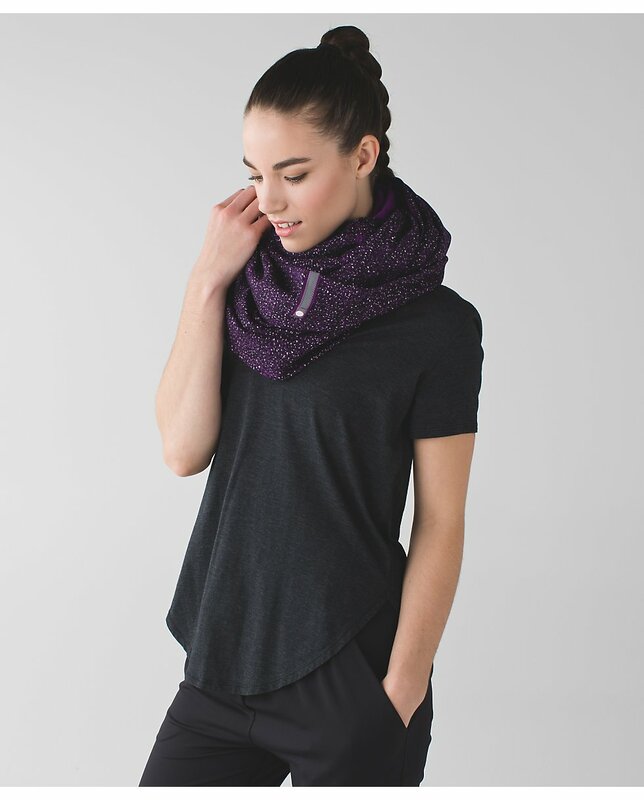 Do not buy this Vinyasa in Fleece, it is SO STIFF and not soft at all. I will have a review up of this exact scarf on my blog soon! Not worth it even at the sale price. Now here is what I ordered. I figured if I don't like them maybe I can give them away as gifts? I have some birthdays coming up! Snow Amazing Toque in Sherpa Berry Rumble $29. 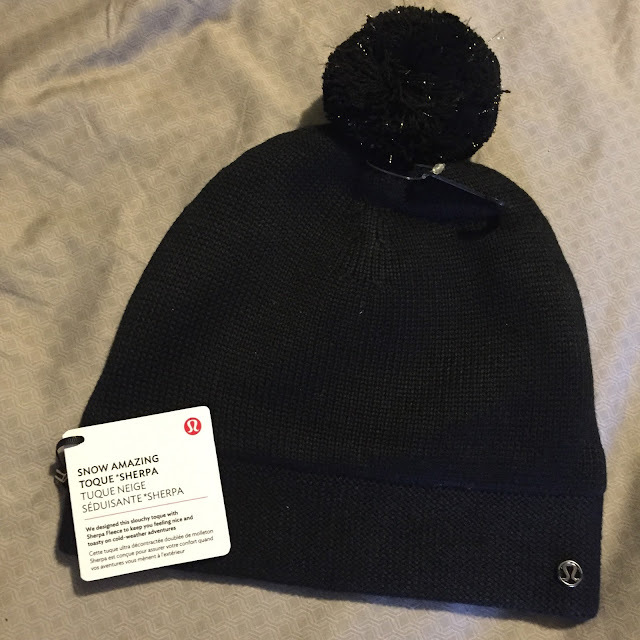 I wasn't able to try these on at the store but I've felt them and they are amazingly soft! 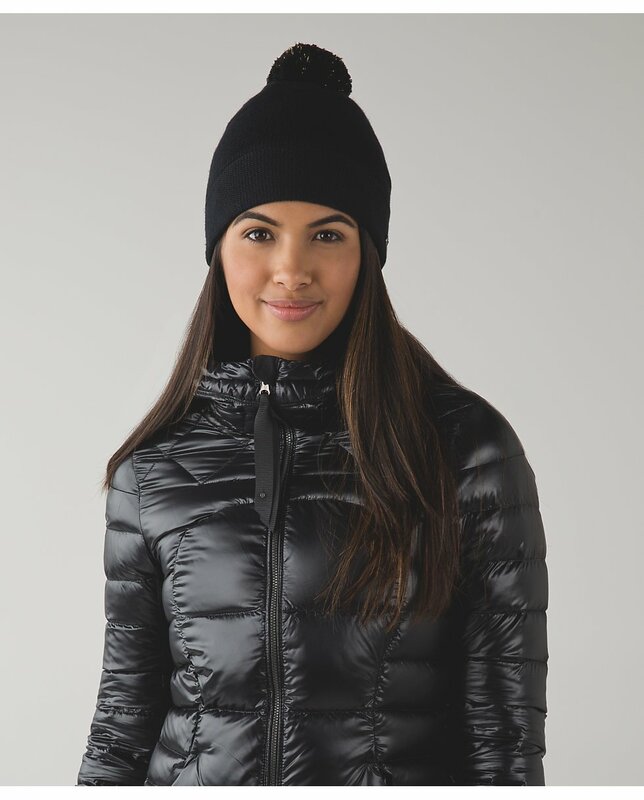 Snow Amazing Toque Sherpa in Black Gold for $29. The gold pom pom is super cute. Snow Amazing Mittens Sherpa in Black Gold $34. How could I say no to a matching set? 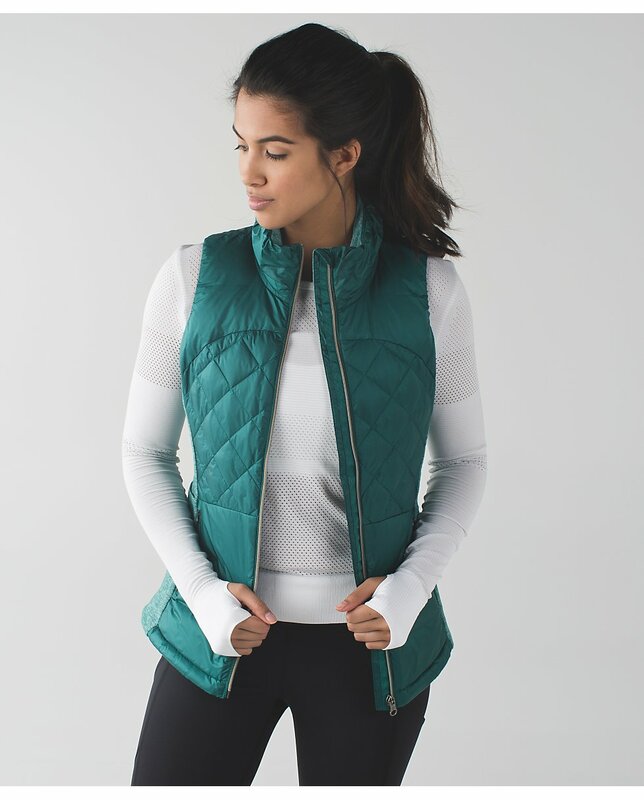 Down For A Run Vest Forage Teal $99. I took a long time deciding between this and Tener Violet. The Teal won. Hopefully I'll like it in person! When I get my order I'll write a review! Happy Shopping Everyone! What did you order? Run Fast Neck Warmer Lights Out!! UK Upload!! 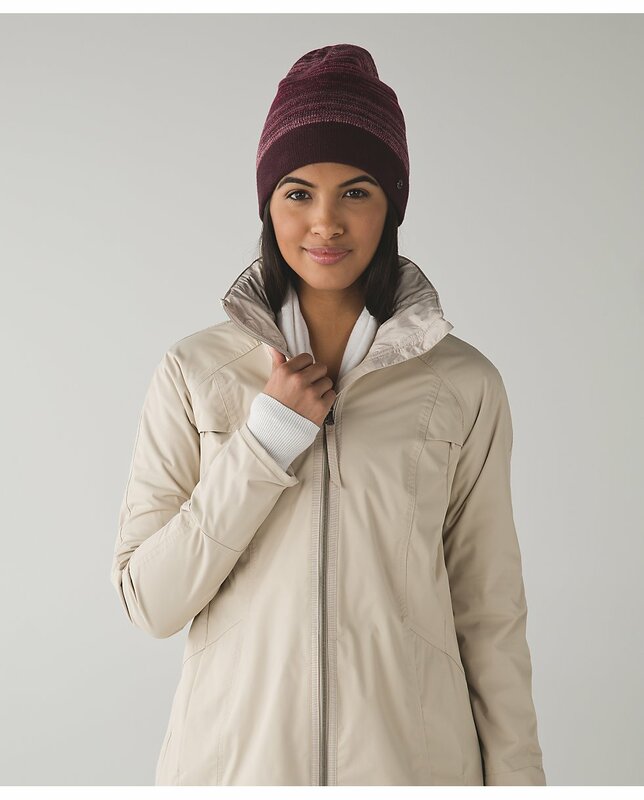 Actually just the Define Jacket!